Now is your opportunity to meet Dr. Arvind Poswal in person, the famous hair transplant surgeon who founded Dr. A’s Hair Clinic. Dr. A’s Hair Clinic is presently the world’s top ranked hair transplant clinic according to our patient statistics based on number of results posted. No other clinic has published more patient results in our open forum than Dr. A’s team. 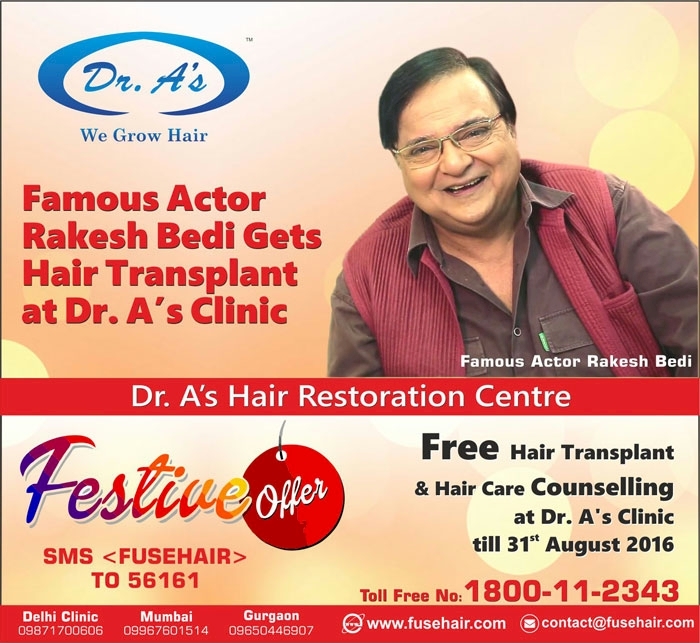 Free hair transplant consultations will be available in Mumbai between Sep 13 - 20. In addition, Dr. Arvind Poswal will be available to meet with new patients in person for in-depth evaluation and consultation Sep 13 - 20. This is a great opportunity to meet Dr. Arvind Poswal in person as well as his dedicated team of medical professionals and seek their expert advice or recommendation for your condition. Dr. Arvind is one of the pioneers in some of the most advanced hair restoration treatments currently available, including FUE, BHT (body hair transplant), beard hair transplant, FUHT strip, scar repair as well as eyebrow & eyelash procedures. Dr. A’s clinic is also our first featured clinic in India to offer SMP Scalp Micro Pigmentation treatment. Find out what this amazing treatment can do for you without having to go through a surgical hair transplant procedure.